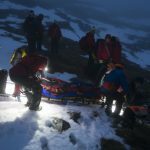 Incident Details: Two young men rang for assistance after getting benighted, without torches, on the top of Blencathra in icy conditions. They had planned to descend Sharp Edge, but got completely lost below Atkinson Pike. 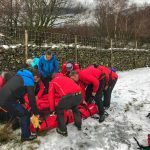 It became clear that they would be unable to get themselves off in the conditions, so a small group went up from the Blencathra Centre and brought them down safely. They were given a lift back to their car. Note: Curiously enough, it still gets dark at 4 p.m in December, and a torch should be in everyone’s rucsac at this time of year ! 6 Team members – 4 hours 26 minutes.